Adam Robinson knows, one way or another, the tiny farmhouse and smokehouse that have stood for more than 100 years just steps from the back of his family’s home south of Mechanicsville must go. He and his wife, Susan, have offered the structures to the Cedar County Historical Society, in hope the weatherworn buildings still have a purpose. Sandy Harmel, who serves as the board’s secretary and museum director, has already picked out a spot for the buildings. With transportation and the buildings being donated, it has the makings of a win-win situation. And, no doubt it will be if the historical society can raise the $15,000 needed to create foundations for the structures in the Prairie Village and begin weathering the structures against additional deterioration. Robinson’s mother, Joan “Louise” Robinson-Fandel, died last September at the age of 87. 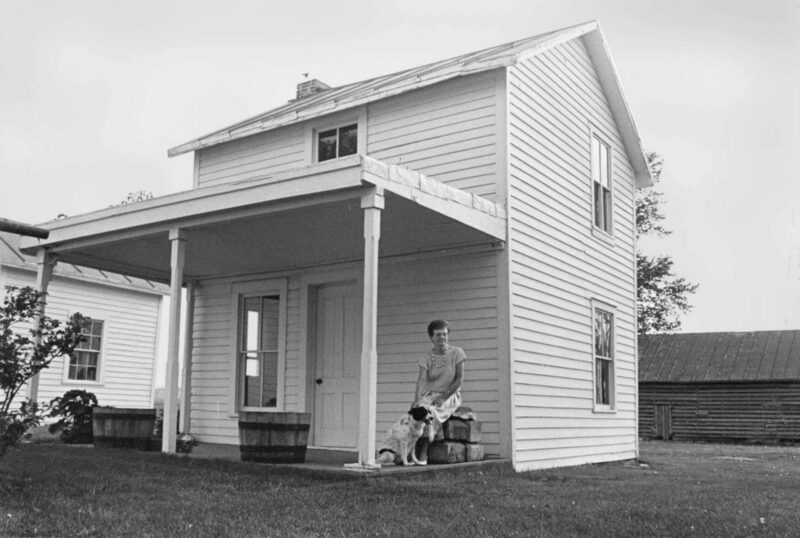 It’s clear from a 1989 Gazette file photo, which shows the Mechanicsville native and her dog lounging on the porch of the little house, that she felt very comfortable on the farm, surrounded by so much history. Louise Robinson, now deceased, sat on the front porch of “Little House” with her dog, Mandi, in this June 1989 Gazette file photo. The weatherworn structures have been offered by Adam Robinson, Louise’s son, to the Cedar County Historical Society. 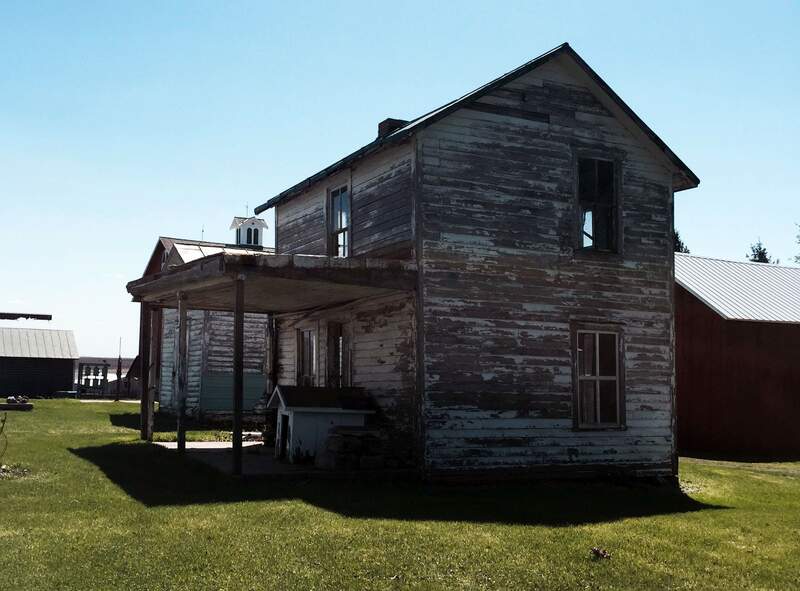 The organization hopes to relocate them to an historical village north of Tipton, but needs donations to build foundations for the buildings and begin preservation. Once home to early Cedar County farm families, the house is located south of Mechanicsville and behind a much larger home. The structures have been used for storage for more than 100 years. It was 1856 when Jeremiah Baughman moved from Pennsylvania to purchase 200 acres in an area known as Pioneer Township, now located south from Mechanicsville along County Road X40. He lived on the property until his death in 1901 and likely constructed the small farmhouse and smokehouse, but the exact date is uncertain. A nearby barn, now known as the “Robinson Barn” and featured on tours organized by the Iowa Barn Foundation, bears a penciled inscription in the oat bin, “Jeremiah Baughman, 1880.” That places construction of the structure now dubbed as Little House between 1856 and 1880, and local historians are hopeful a more exact date might be lurking somewhere on its interior woodwork. The property was sold in 1904 to James Shrope, Jr. His father had also moved from Pennsylvania to the area, arriving in 1855. It was while the property was owned by the Shrope family that a new, larger homestead was constructed. Little House was moved a few feet to make room for the larger house, but was otherwise left intact. In the years since, the primary function of the structure has been for storage. 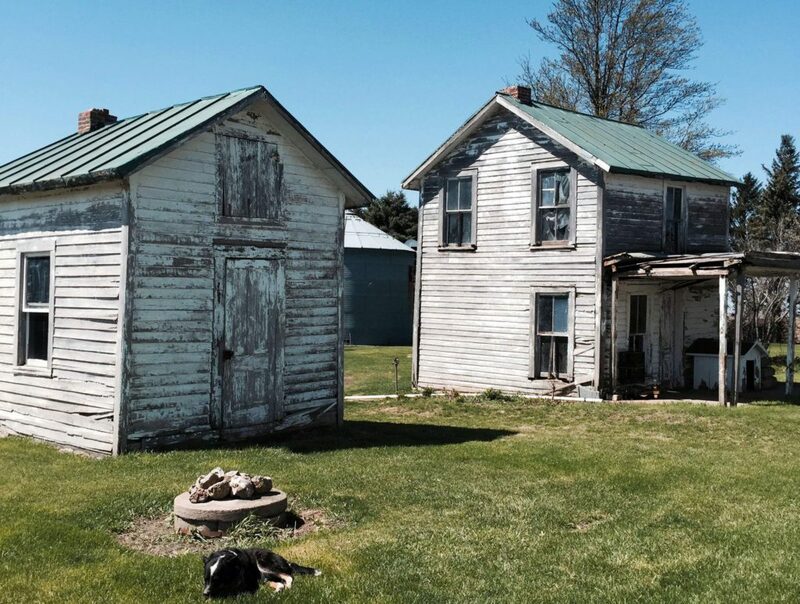 The proximity of the two houses might be an oddity if they haven’t stood as a part of Cedar County’s landscape in that fashion since 1904. After so long, it is more likely motorists will do a double-take once Little House has been relocated. 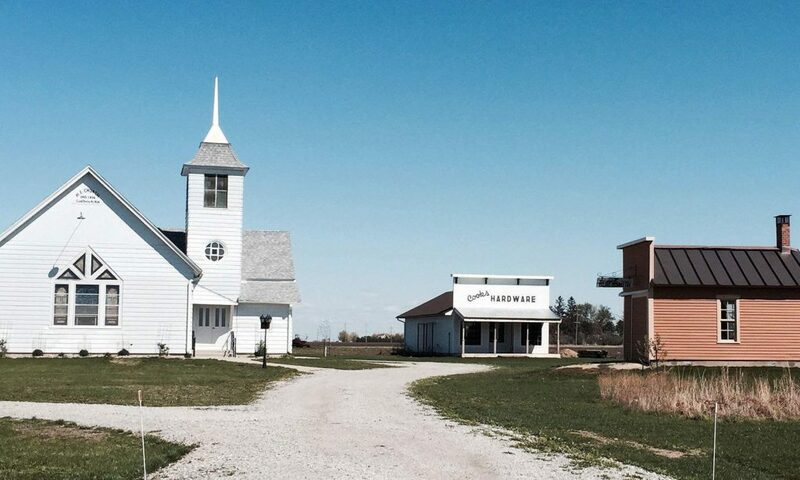 The Cedar County Historical Society maintains Prairie Village, which is located just behind the offices and museum on Highway 38, north of Tipton. 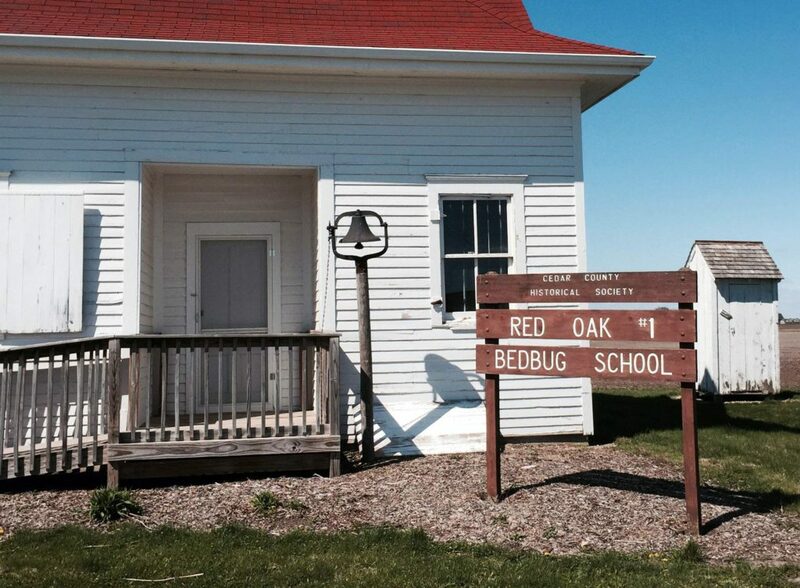 The site is home to the 1842 Fraseur Cabin, 1856 South Bethel Church, 1910 Bedbug school building, a working blacksmith shop, a tinsmith shop and hardware store (which bears the sign of Cook’s Hardware that began in Mechanicsville in 1926) and four acres of land that’s previously been farmed with vintage implements, horses and lots of manual labor. What Prairie Village doesn’t have is a vintage farmhouse, and Harmel believes Little House would make a perfect addition. Like many of the buildings already in the village, the house is a product of the 1800s and there are few of its generation remaining. And, just as its nickname implies, it’s small — just 14 feet by 16 feet for a footprint, and 16 feet tall at its highest peak. 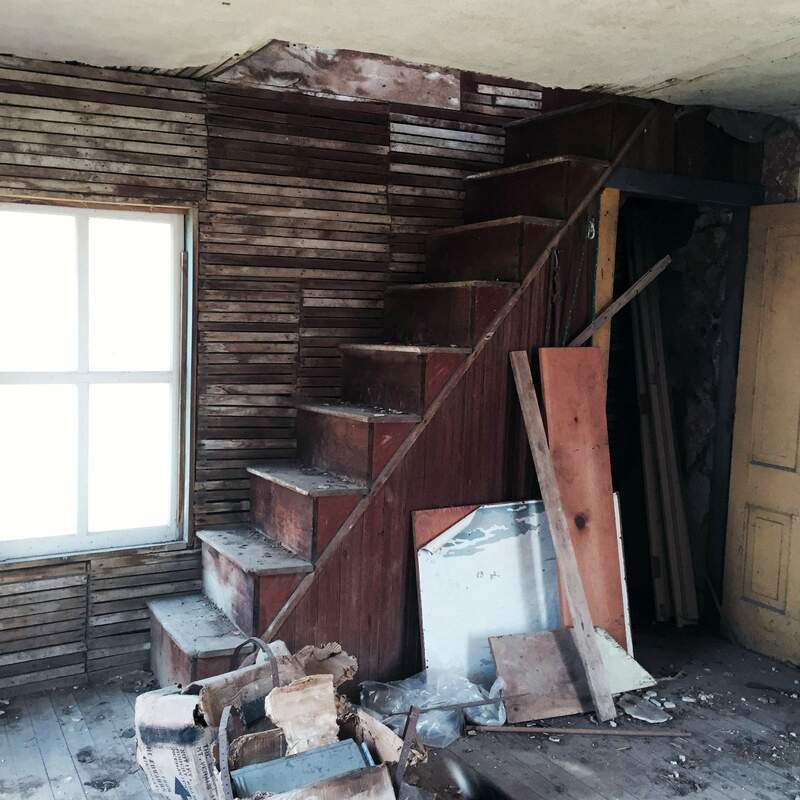 While much of the interior will require renovation, a wooden staircase between the first floor family area and second floor sleeping quarters remains relatively sturdy. The existing porch, significantly damaged in a wind storm just last summer, will likely need to be removed; a similar one constructed at a later date. The smokehouse, according to Robinson, is slightly younger than the house. It was used as a summer kitchen and primarily for smoking meat. It’s interior, he said, still is smudged with its purposeful history. Excitement vibrated in Harmel’s voice as she discussed Little House, the smokehouse and its possible addition to Prairie Village. She says she’s long loved all things historical, but understands not everyone feels the same. Six classes of second-graders are scheduled to visit the museum and village in the coming days, she noted, and presenting the history of Cedar County to them in a three-dimensional and fun way helps the children better understand where they live and the pioneers who made it possible. Cedar is the only county within the area that comprises the Creative Corridor to be designated as noncore by the U.S. Census Bureau. This means there is no community with a population above 9,999. Tipton, the county seat, was estimated to have about 3,200 residents in 2013. The entire county has about 18,400 people — about 400 less than in 1978, and down about 100 since the last official census in 2010. Obviously, not everyone who grows up here decides to or is able to stay. Most travel to college after high school graduation, and a large number never permanently return. But Harmel believes — as do I — that young people need information about their communities and knowledge about where they came from so their decisions can be informed. The historical society hopes to move Little House to the Prairie Village in June, but the donation of the structures was unexpected and not part of its operating budget. 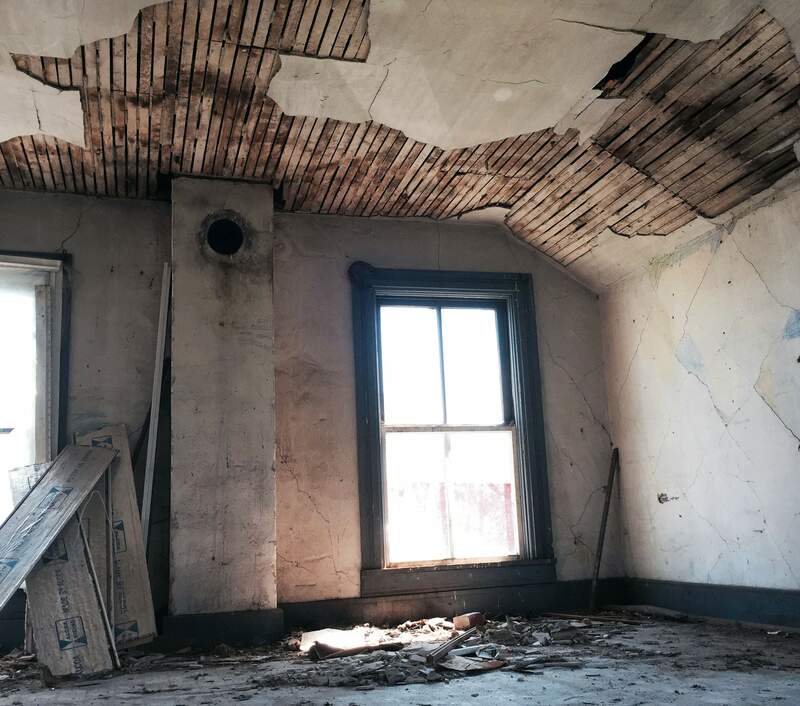 If the group can’t meet the deadline, the house that contains so much of Cedar County’s history may be offered to a different preservation group or, worse yet, may erode to a non-usable state and be demolished. Not only have the Robinsons freely offered the structures to preservationists, but many local and area residents have agreed to donate their labor and vehicles so that the buildings can be moved to the village. Still, it does little good to move the structures if there is not a place for them. 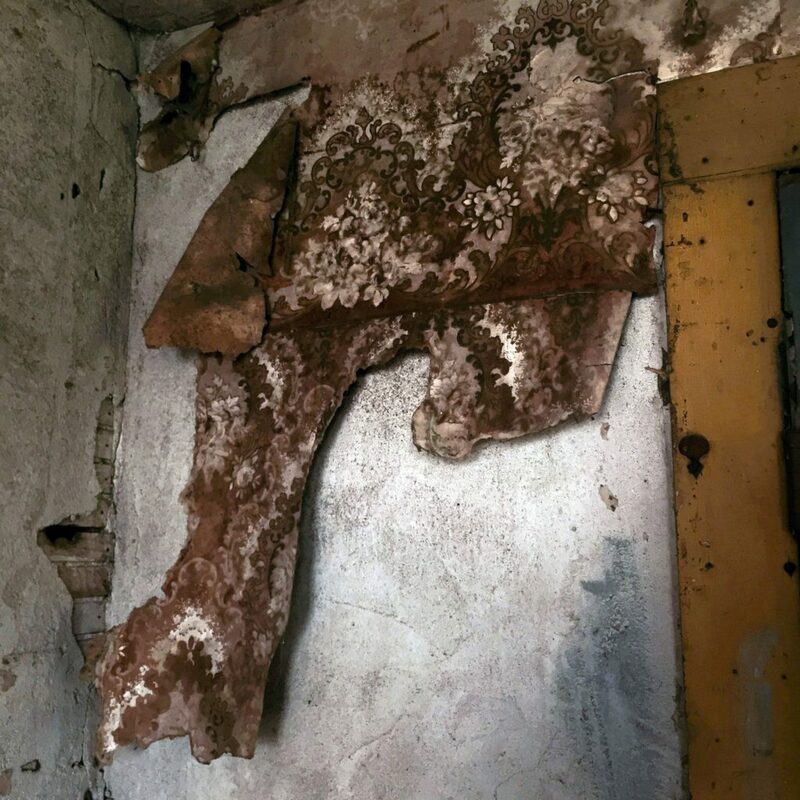 Leaving the wood atop the soil would further deteriorate the walls and floors. Windows will need to be covered, if not replaced, and whatever is shaken up during the move will need to be tightened. Additional preservation is needed for doors and walls, but the foundations, which carry a $5,000 estimate, must be completed before the house and smokehouse can be relocated. Readers interested in learning more about Little House or the Prairie Village should stop by the museum during its hours of 10 a.m. to 4 p.m. on Tuesday and Thursday, or 10 a.m. to 2 p.m. on Saturday. Photographs, additional history and a Little House pledge form are available on the organization’s website. Alternatively, donations can be mailed to the Cedar County Historical Society, P.O. Box 254, Tipton, Iowa 52772.